Choosing some knitting wool is usually predetermined when picking a pattern to knit an item. The size of the item is also a limiting factor as a baby cardigan would not be knitted in chunky wool. Just like an outdoor winter jumper would not necessarily be knitted out of fine 3ply wool. 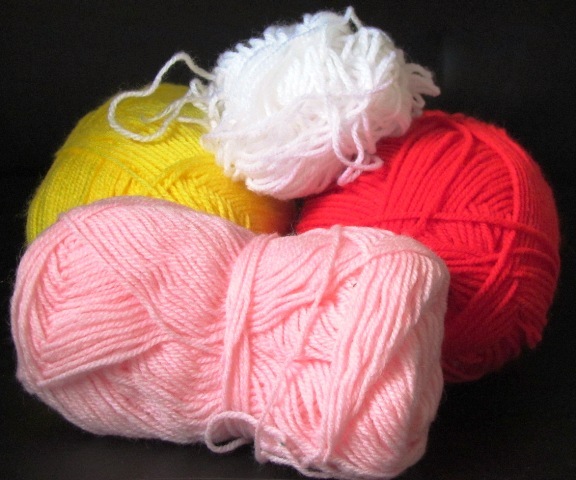 Larger items can be made with fine wools but will take quite a while to knit. There are many different types of sources that the wool can be made from either plant based, animal based or synthetic. These are the cotton and linen based wool and can be mixed with other fibres to get different qualities. Pure Cotton tends to be a bit coarse but good for items like bags and placemats. There are different types of cotton such as Egyptian or American. A less common plant based yarn is bamboo. This is what most people would see wool as "coming from sheep" but other animals have wool made from their fleece and with different descriptions. Angora Hair or Angora Fibre is produced by the Angora Rabbit. Silk is made from cocoons of insects. Acrylic is a well known one and can feel as soft and warm as pure wool. The advantage of acrylic is that it is machine washable so is great for baby items and pet items. Nylon is usually mixed with other fibres to give added strength and it isn't usually used on its own. Rayon is made from cellulose and made into threads. Different countries describe the thickness of the wool as "ply" or categories. When walking into a wool shop, the varieties that are available is sometimes quite confusing. There are the pure wools, acrylics and varying mixtures in between so it is best to have an idea of what is needed before purchasing. There are a lot of on line outlets shown on my shopping page. Wool is usually bought in balls of different weights, it can also be bought in skeins or hanks but then wound into balls at home to stop it all getting tangled up. There are also a lot of tools to help stop the wool from falling off a surface and traveling around the room. Enjoy choosing your wool and beginning your project.